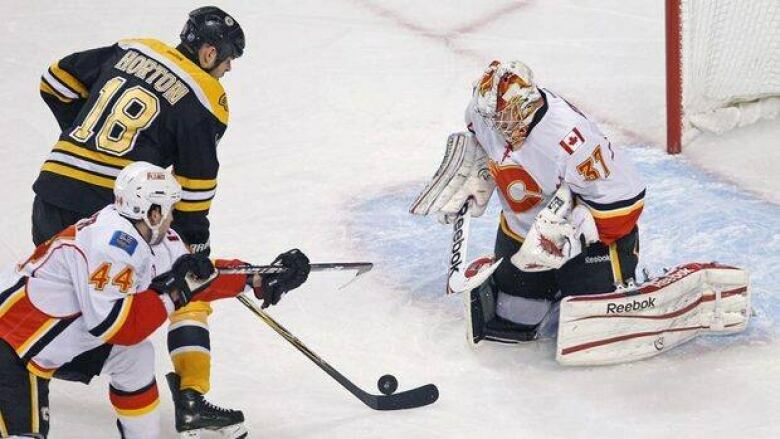 Nathan Horton and Patrice Bergeron each had two goals and an assist, Tuukka Rask earned his third shutout in four starts and the rampaging Boston Bruins cruised to a 9-0 blowout of the road-weary Calgary Flames on Thursday night. Any fears that Bruins coach Claude Julien might have had about his team looking past Calgary and toward a Stanley Cup rematch with Vancouver were quickly laid to rest Thursday night. The Flames didn't last long, either. Nathan Horton and Patrice Bergeron each had two goals and an assist, Tuukka Rask earned his third shutout in four starts and the rampaging Bruins cruised to a 9-0 blowout of the road-weary Flames. "To be honest with you, no one talked about Saturday in the dressing room. We were all worried about tonight," Bergeron said. "That's the approach we've had all year and now our next job is Saturday — so now we really have to worry about them. It's going to be a tough game, so tomorrow we need a good practice and be ready for that." Boston beat the Canucks in seven games last year in the Stanley Cup finals and Saturday is the only time the teams will play during the regular season. "We have to approach it as the next big game for us," said Bergeron, who had four goals and an assist as the Bruins beat the Devils and Flames by a combined 15-1 the past two nights. "That's the way we've been approaching every game all year and it's the same thing again." Julien said last season's playoff run taught his players how to focus on the game at hand. Playing for the second straight night Thursday, the Bruins came out flying and scored three goals in the first 8:49. After the game, coach Brent Sutter made his players sit and face the media right away after their dreadful performance. "It was embarrassing," said captain Jarome Iginla, still seeking his 500th goal. "We got totally outworked and outcompeted. We got pushed off the puck all night and we were terrible. One of the worst games in memory. "No excuse for the game we put on. We'd lose to every single team if we played like that." The 34-year-old Iginla failed for the second straight game in his bid to become the NHL's 42nd 500-goal scorer, the 15th to do it with one team. The Flames open a four-game homestand against Minnesota on Saturday. Iginla was robbed by Rask midway through the second period, probably Rask's toughest save of the game as the Flames didn't put up much of a fight. "Tough on every one of those guys to go through that," Sutter said. "I've been in games like that and been in their shoes. The first three goals happened so quickly and we didn't seem to have a response at that point. It wasn't a pretty outcome." Five different Bruins had three points and three more had two. Bergeron scored twice for the second straight night. David Krejci and Tyler Seguin each had a goal and two assists, and Benoit Pouliot added three assists. Milan Lucic, Chris Kelly and Daniel Paille (short-handed) also scored for the Bruins. Paille capped the outburst at 8:43 of the third and Bruins fans chanted "We want 10!" for the rest of the game. The Bruins scored six times against goalie Leland Irving by the 4:15 mark of the second period, chasing the rookie as he took his first regulation loss in four NHL starts. Mikka Kiprusoff, who was supposed to get a rest, gave up the last three goals. It took the Bruins just 1:14 to open the scoring, on Seguin's goal, and it was 2-0 at the 3:17 mark when Sutter used his timeout. It didn't help. It was 3-0 at 8:59 and the Bruins then scored three times in the first 4:15 of the second.